We’ve had a very bright and sweet intern from one of the colleges in the region working for us this summer, and yesterday, along with the other interns, she gave a, “What I did during my summer internship” presentation. Seems she did enjoy our time with us, but one comment she made that really hit home was that the process of book editing and publishing wasn’t nearly as fun or glamorous as it’s painted in movies like The Devil Wears Prada (no kidding, given I’m one of the few females in this industry, and while I’m thankful to get a new camo quad parka gratis every now and then, this girl could use a little Gucci, lol!). She’s right, it’s not usually very glamorous. And fun? Well, let’s just say you have to love the correct placement of a semi-colon to get your kicks out of much of what goes on in our offices to bring a book from raw manuscript to printed product. The one exception is our newest book, Gun Digest Illustrated Guide to Modern Firearms. We realized that the average buyer looking at guns for sale sees only a fraction of the huge number of firearms offered by DPMS, Mossberg, Taurus, Winchester, and all the others, simply because each local gun shop (and even the big-box stores like Cabela’s and Bass Pro Shops), has only so much shelf space and will stock only the guns its local market seems to demand. But there’s sooo much more out there! So we put our heads together and mapped out a book that gives you that “so much more”—and all of us here at Gun Digest had an absolute ball putting it together. You see, the staff here gets to deal with fabulous photography from all the manufacturers every day, plus we get our hands on the actual guns sometimes far in advance of the general public, so we get to do a lot of oohing and ahhing and neato-keening on a regular basis. 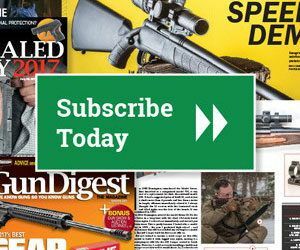 The Gun Digest Illustrated Guide to Modern Firearms, then, is kind of your behind the scenes look at what we work with 365 days a year. We think any gun lover, novice to expert, casual hobbyist to serious collector, will just love thumbing through these pages, doing their own oohing and ahhing and drooling over all the fabulous guns pictured here. With each gun genre represented—pistol, revolver, shotgun, rifle, rimfire, blackpowder, tactical, and all things AR—plus a special section on custom guns from our outside resident expert Tom Turpin, this is one of the most drool-worthy books on firearms out there. So take a peek and then sharpen your pencil and whip out a pad of paper, because we promise, when you get done with this one, your gun shopping list is going to be very, very long. Click here to get the Gun Digest Illustrated Guide to Modern Firearms at a great discount from GunDigestStore.com.